The house, techno and electro fest returns for its summer edition, July 7-8 2017. What? House, techno and electro fest with an international line-up. The Peacock Society Festival brings techno, house and electro music to the Parc Floral this summer, featuring some of the biggest international DJs. 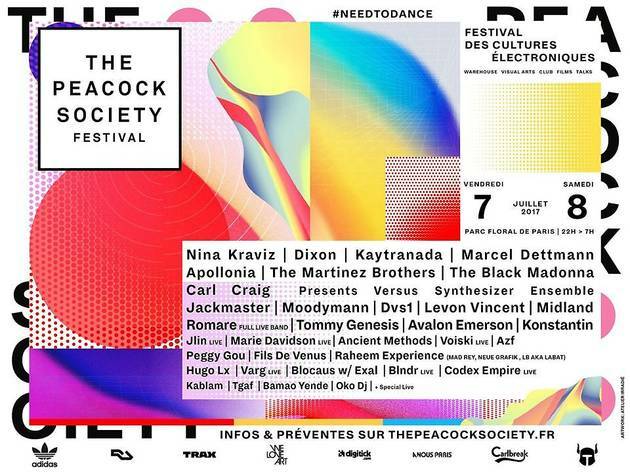 This year, the programme spans Ibiza headliner types Nina Kravitz, Dixon, Kaytranada, Marcel Dettman, Apollonia, The Black Madonna, The Martinez Brothers, Carl Craig set to bring a splash of Balearic sunshine to the French capital.